An artist needs to look good when doing their thing in front of an audience and effective lighting is a dynamic addition to a performance. StompLight is the ultimate stage lighting hack. 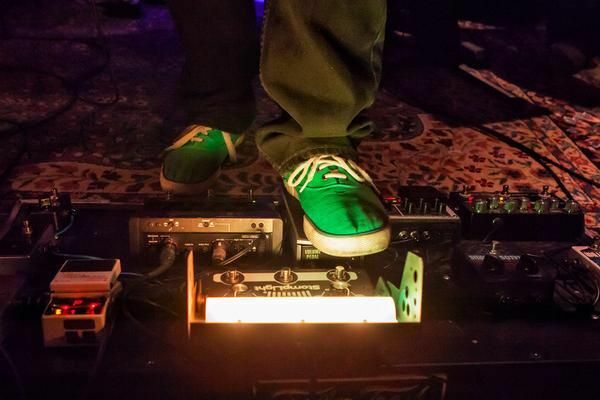 The StompLight® DMX Pro effect pedal allows an artist to create stage lighting in seconds anywhere. 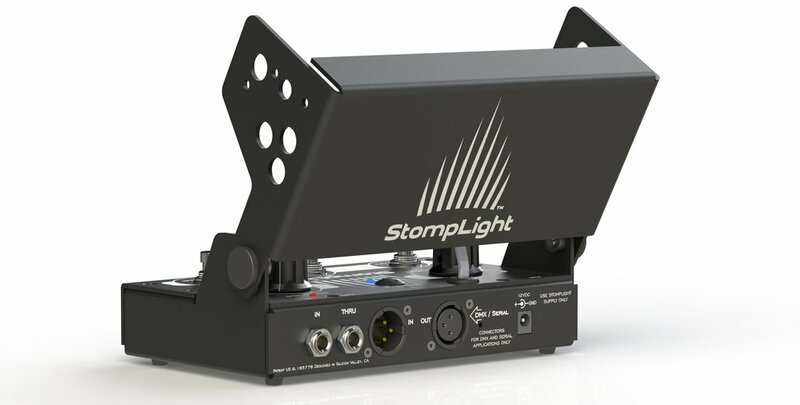 Super portable and built to last, StompLight works great as a stand alone light while also being the world's first effects pedal that is DMX512 compatible and designed to work seamlessly with the StompLight® Pal or other DMX512 lighting products. 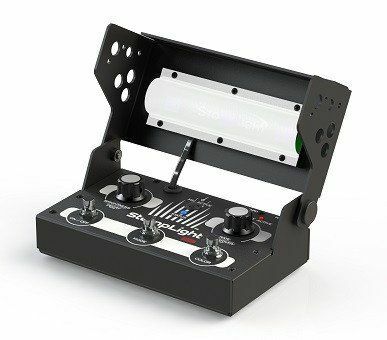 If you have an existing DMX512 system the StompLight®DMX Pro can function as a controller and/or slave. 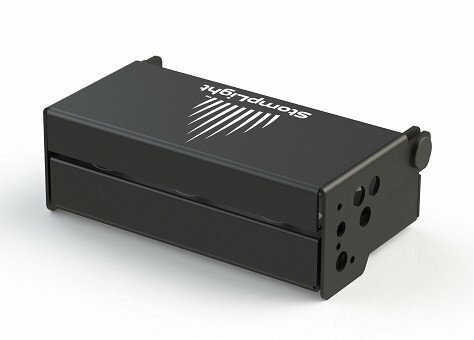 Add the Stomplight PowerBank and you can use StompLight anywhere you perform, rehearse or jam without AC power. The Color Wheel - Cycles through all the color variations with adjustable speed and brightness. The "turn it on and leave it" effect. Select a Solid Color - Choose a color as the mood hits you and wash the stage. Stunning colors include Ice Blue, Rasta Green, Purple People Eater and Demon Red. You can also choose a color from the Color Wheel and add it to the Solid Color palette. Microphone Active (aka Color Organ Mode) This mode utilizes the built-in microphone and internal 7-band spectrum analyzer to create lighting that responds to your playing and frequency of the audio you produce. Drummers will love this mode! Sound Active Mode works great for bands, house music and DJs looking to add visual response and dynamics to a performance, session or rehearsal. Strobe - Switch to the classic strobe effect with adjustable speed and brightness for dance parties, raves and haunted houses. I play acoustic solo shows. Even with the band we sometimes get stuffed in a corner by the dart board and the only lighting I have is the ones I bring. That is where StompLight can help as it’s a personal lighting effects pedal for me and my band. 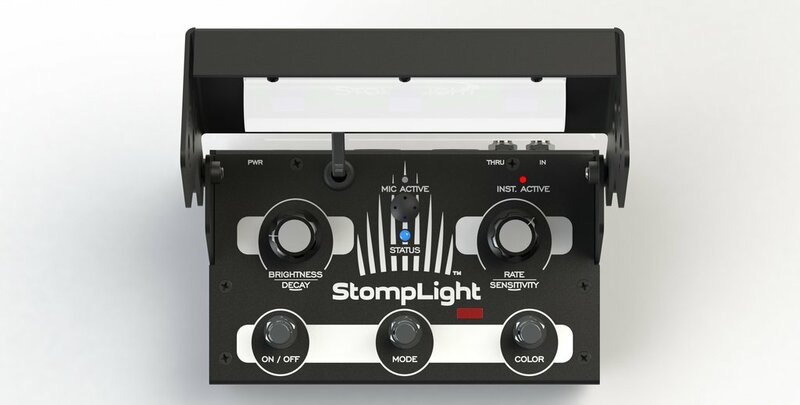 The StompLight Lighting Effects Pedal is a non-DMX controlled pedal that can put put into your guitar effects board or simply placed on the floor. A 3 button, 2 knob pedal will allow you to turn on and off the lights, set the color and even set the mode from a single color to strobe, fading and more. The built-in microphone allows the pedal to listen and react to the music. You can even plug it into your sound so the StompLight only reacts to what you play or sing. Adjust the sensitivity to create the emotional environment you are looking for. With the additional power supply option, you can use this pedal in a portable setting. The battery will allows for around 7 hours of use. Also a perfect light for load-out so you can see what you’re doing. Finally, you can get a few StompLights and connect via the cable to control all at once.